This post originally appeared on Root Realty's Blog and is republished with permission. Find out how to syndicate your content with theBrokerList. When thinking about the perks of investing in real estate, many people understand appreciation and leveraging their money, but few think about leveraged appreciation. This is a simple concept but can make an attractive real estate investment a knock out. In its basic form, leveraged appreciation is realizing the gains from a property appreciating without having to put 100% cash down to own it. If an individual wanted to realize the gains from $500,000 worth of Nike stocks they would have to pay 100% of that stock. For a commercial real estate investment property, however a $500,000 property could be purchased with as little as 25% down bringing you’re out of pocket cost to $125,000. However, as the property appreciates the owner of this property reaps the benefits of appreciation of the entire 500k. For instance, if the property appreciated 6%, that’s $30,000. With $125,000 down and a $30,000 leveraged appreciation that’s a 24% return on just appreciation alone, if you add in the return you get on the yearly rental income the deal becomes a knockout. Of course, it is important to remember a few things. The first is that to cash in on appreciation one would have to either sell or refinance the property otherwise the rise in value only adds to your net worth. The second is that appreciation is not a constant upward slope there are years when values fall and rise. 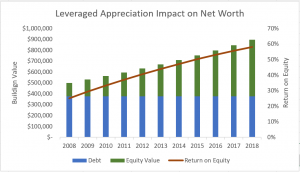 Which means reaping the benefits of appreciation has a lot to do with the timing of when you buy and sell the asset, there are no crystal balls, but holding for the long term has resulted in positive annual gains. Appreciation should just be the cherry on the cake your asset should be making a yearly return from rents that you are comfortable with. What does that mean for Chicago investors? Below we have the appreciation rates of Chicago as a whole, Logan Square, Woodlawn, and Lincoln Park. Logan Square is an area that is on the back end of an “up and coming area” cycle, Woodlawn is right in the midst of it, and Lincoln Park is already established. * Appreciation over a 10-year snap shot. Chicago’s diverse neighborhoods offer a variety of returns and appreciation rates. As investor do you want a lower appreciation rate but a stabilized neighborhood that has less risk, a higher appreciation in a more volatile neighborhood, or something in-between? When picking your next investment property don’t forget to check the appreciation rate, see where in the cycle you’d like to be, and factor it to decision matrix. The post Leveraged Appreciation In Real Estate Investments appeared first on Root Realty. Since 1983 Root Realty has focused on delivering excellent client service to Chicago real estate investors and their tenants. We make real estate investment simple by providing best-in-industry, fully integrated services from initial investment suggestions to the sale of your building, including property management and renovations.